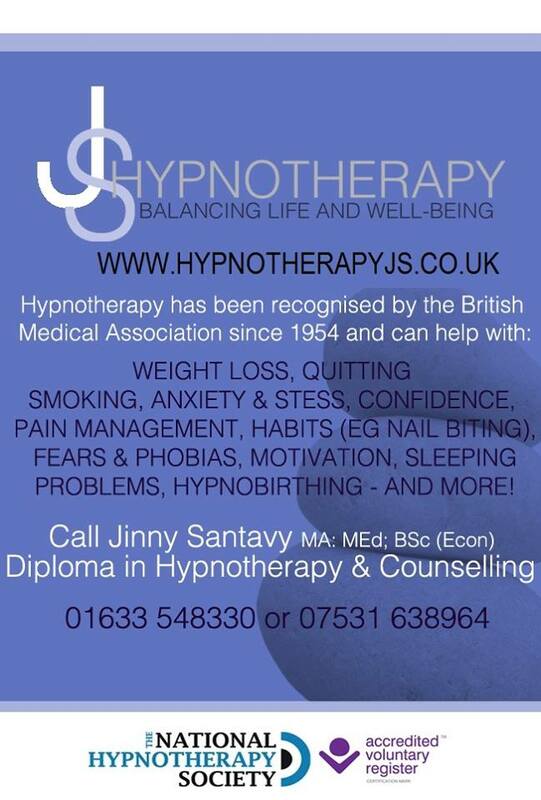 J S Hypnotherapy is a private hypnotherapy practice based near Newport, Gwent (South Wales) with prices starting at £45* per session. Hypnotherapy can be applied to issues. I have a passion for working with people and can help YOU achieve your goals. I am a fully qualified hypnotherapist. I also have additional skills and qualifications in Guidance and Counselling, Psychology, Diet and Nutrition and Mindfulness – to support YOUR needs. Hypnosis is a perfectly NATURAL and SAFE state between being awake and asleep . My clients often experience a feeling of being in deeply relaxed state, and not dissimilar to daydreaming. You cannot be coerced into doing anything you don’t wish to do. Hypnosis can be traced back to ancient civilisation. It can be applied to a wide range of medical and psychological problems*, and also to enhance performance e.g. sport, confidence, public speaking, motivation, exams/tests. Hypnotherapy is one of the growing Complimentary and Alternative medicines (CAMs) used. It can be used alongside medical treatments, Complementary. For example, with cancer treatments to help with the side effects, such as pain and sickness. Or it can be used instead, as an Alternative, to medication. For example, to manage pain instead of medication. Hypnotherapy can help with many issues. They include losing weight; stopping smoking; stress and anxiety; pain management; habits (such as nail biting); fears and phobias (such as fear of flying; phobia of spiders); confidence; motivation; child birth (hypnobirthing); insomnia (sleeping problems) … and more – just ask me! I will work with you and devise a tailor-made treatment plan. This will involve a consultation to assess your needs and requirements. You are a unique individual- and so will be your treatment and experience. Counselling will run alongside your treatment, as required. Similarly, aspects of Mindfulness may be included in treatment programmes, and for Weight loss, Diet and Nutrition advice. *For further information on pricing, please see page “Fees” or contact me direct. **NB: Some conditions such as epilepsy and psychosis are not recommended for hypnosis. Any medical concerns should be checked with a medical profession before starting hypnotherapy.